I am so happy it is tamarilo season once more. I love tamarillos. Not just for their cheek-sucking tartness, but also because I think they are one of the most beautiful fruits, with their plump, ruby skins and yellow flesh. 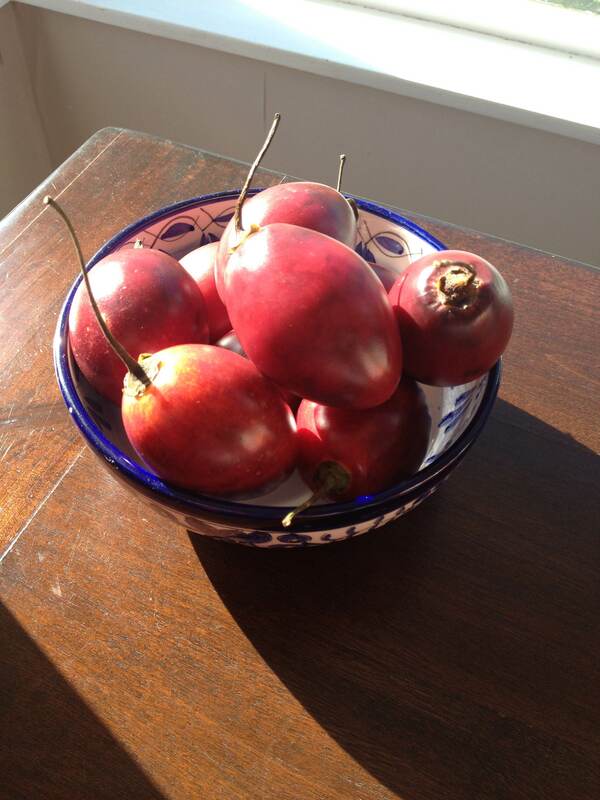 Tamarillos, which were once known as the very cute name ‘tree tomatoes’ in New Zealand, are considered by some to be the lost fruit of the incas. How exotic! These gorgeous little fruits spring from the Andes, and are now found in countries including India, USA, China, Malaysia and of course New Zealand. And it’s not only me who loves them…one half of our recent two-cat addition to the family spent the best part of the afternoon pestering the tamarillos too. My inspiration for this recipe comes from the New York Times plum torte. I was introduced to this delight by my good friend Sondra who, as it happens, also introduced me to our new cats the same night. I love the story behind this plum torte. It was published every Autumn for seven years until the editors decided that was plenty long enough. However, this was met with outrage and a slew of angry letters, and so now it is published every year, just in time for Autumn. So, with many thanks to the New York Times and its plum torte-loving readers, here is my take on their classic, with my beloved tamarillos. Halve the tamarillos and scoop out the flesh into a bowl. Add the vanilla essence, sugar and cinnamon. Combine and set aside. In a large bowl, cream the butter and sugar until light and fluffy. Add the flour, baking powder, salt and eggs, and beat well. Spoon the batter into a springform cake tin, between 20 – 25cm diameter. Place the tamarillos over the top of the batter and drizzle with the remaining liquid. Bake until the torte is cooked through and springs back to the touch, approximately one hour. This is quite lovely served warm with some yoghurt, or even better, cream.